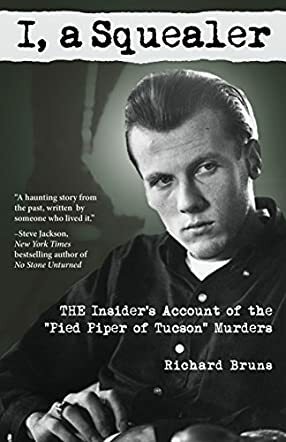 I, a Squealer: The Insider's Account of the Pied Piper of Tucson Murders by Richard Bruns is a fascinating and disturbing account of his friendship with, and ultimate betrayal of, serial killer Charles Schmid. Bruns wrote the account after the events leading up to Schmid’s arrest, which gives it a feeling of immediacy and urgency that may not have been present if it were told after many years had elapsed. Bruns takes the reader with him as he discusses his fear and anxiety in the face of Schmid’s deteriorating mental health. After Schmid confessed to killing three girls and implied that Bruns' ex-girlfriend, Kathy, should also die, Bruns became obsessed with protecting her, and eventually had a restraining order filed against him for stalking and was ordered to move to Columbus, Ohio to live with his Grandmother. While it doesn’t make sense at first that Bruns continued a friendship with someone he believed had murdered defenceless girls, it becomes clear that Schmid had an ability to hold people and bend them to his will. Bruns describes the Schmid he befriended as a charming, popular, good-looking guy whom everyone wanted to know. It seems when Bruns was sent away from Tucson, the break from Schmid’s company was enough to make him realise he must tell the police about his friend. When Schmid was arrested, he claimed Bruns was the murderer, and it seemed that many in the community shared his belief: rather than being commended for getting a killer off the street, Bruns was ostracised. I, a Squealer by Richard Bruns also includes police photos and newspaper clippings during and after the trial, and has received plenty of praise. This is not without reason. It is a gripping tale told in a straightforward manner and personable voice.